1950 Hong Qi (Red Flag) Saloon. The following photo was received from Joe Kaprikorn currently based in Beijing, China. 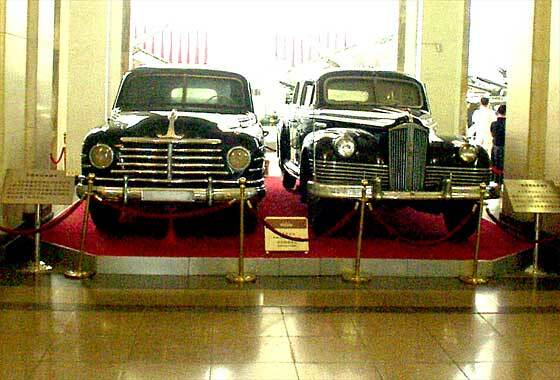 He recently visited the "The Military Museum of the Chinese People’s Revolution" in Beijing and took a photo of two cars. The description plate besides the cars read "Hong Qi (Red Flag) cars used by Chairman Mao & Premier Zhou". The car on the right he subsequently found out was a ZIS 110, but the one on the left remains un-named. He feels this too is likely to be some Soviet make. The car on the right is very obviously a ZIS. We can advise that we have dealt with an enquiry from Beijing on the subject of a ZIS 110 in Xinjiang in 2003 and had established some interesting history on the make. This is featured very briefly towards the bottom of our Help Page 2 and in detail on the ZIS 110 Information Page. In brief the ZIS is a Russian car made by "ZIS" (Zavod Imieni Stalina) in Moscow. The origins of the model 110 were during the ZIS period when earlier cars had engines believed inspired by the Buick straight eight. The Model 110 came about as a result of a present given to Iosif Vissarionovich Dzhugashvili 'Stalin' by Franklin Delano Roosewelt of USA of a Packard Super Eight. This resulted in machines and dies being supplied to ZIS for production of an adaptation of the Packard Series 180. The car on the left is of a similar period and is marked as Hong Qi, 'The Red Flag' There seems to be massive confusion especially on the internet about the Hong Qi ‘Red Flag’ car. From what can be made out, the Hong Qi car was made by the First Automotive Works (FAW) in Changchun. The company was initially set up to manufacture the Jiefan lorry. Their first car appears to have been the Dongfeng (East Wind), launched in 1958. (Donfeng seems also be a current car manufacturer elsewhere in China). Dongfeng car seems to have been based on cars obtained from Skoda (Octavia), Simca (Ariane), a Ford (Custom) and a Mercedes 190. 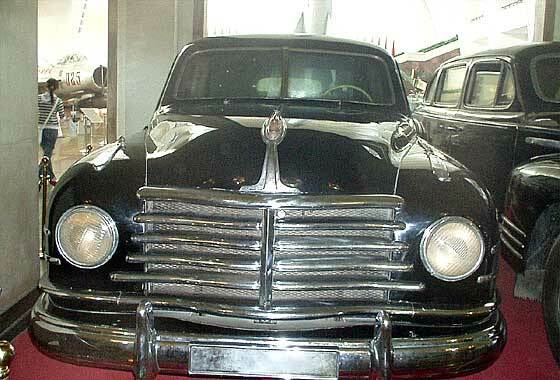 The first Dongfeng seems to have been presented to Mao in May 1958 in Beijing and was basically a production car. This was not the Hong Qi ‘Red Flag’ limousine, nor is it the above car. The car on the left is much more of a mystery. It has a similarity to cca 1942 Chrysler or Dodge cars, with a hint of Simca and Skoda from the headlamp positions. Either way this too is not a mid 1960s Hong Qi. We had quite some difficulty in trying to identify this car and got nowhere. There was nothing like it made in China and nothing like it made in the USSR. The nearest was the GAZ Pobeda (later also made as the Warszawa in Poland) but the shape, dates, history and features did not match. We contacted all our normal sources of external information and were eventually rewarded by being advised by GordonKebble in France that this is a SKODA ! Skoda were of course were a very advanced manufacturer of high quality cars as Laurin & Klement. The merger with Skoda Plzen and subsequent 'ComEcon' period tarnished the company name and reputation. 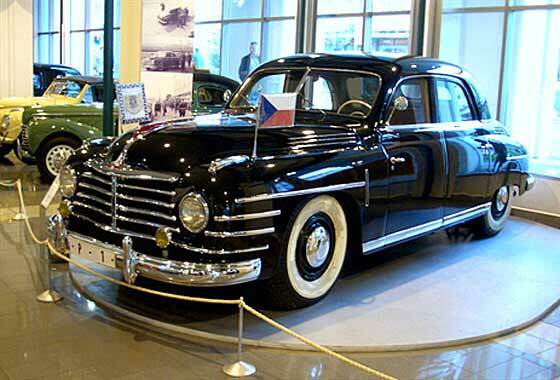 Further investigation of the Skoda connection determined that Skoda Cars during the years 1948 to 1952 made a low production special limousine called the VOS, "Vladni Osobni Special", loosely translated as the 'Government Special Car'. It was made in the Skoda plant in Mlada Boleslav but is believed to have been based on a Tatra chassis, utilized the Praga truck engine and had the body made by Karosa (Sodomka as was). In retrospect the Skoda connection to China's first car the Dongfeng should have rung a much louder bell. What is particularly embarrassing for me personally is that in my earlier life during the Comecon period I used to visit all these factories regularly while trying to sell them British machine tools!